Sources within the EFCC also told our correspondent that it foiled a fresh attempt by Patience Jonathan to withdraw $5m from her frozen account during the week. The source said the commission was informed by Skye Bank that Patience had placed a standing order for $5m to be withdrawn from the account but it was stopped. 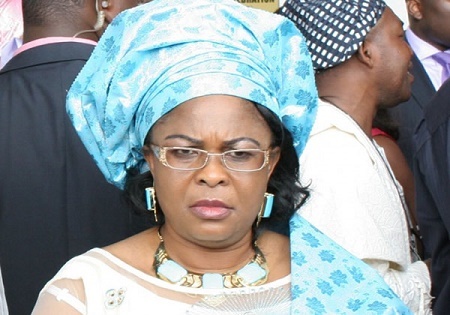 The detective added, “We received an alert from Skye Bank during the week that Patience attempted to withdraw $5m from her personal account titled Patience Ibifaka Jonathan which is domiciled at the bank. It will be recalled that the EFCC had frozen four other company accounts with a balance of $15m. The accounts were linked to a former Special Adviser to Jonathan on Domestic Affairs, Waripamowei Dudafa. However, during the arraignment of Dudafa and the directors of the companies, Patience filed an application claiming ownership of the money. She subsequently asked the court to lift the restriction on the accounts. On Wednesday the directors of the companies pleaded guilty to money laundering. The EFCC applied for the money to be permanently forfeited to the Federal Government, a request which has been deferred by the Federal High Court.